The main pathophysiologic mechanism behind PJI includes either direct contact or aerosolized inoculation of the implant and/or the surrounding tissues with microorganism(s) at the time of the procedure.8 Biofilm formation on the implant surface and subsequent microbial expansion has been the predominant theory behind the development of PJI.9 The clinical manifestation of PJI can vary and is usually affected by factors such as the patient's age and history of disease(s), surgical technique, type of prosthesis, and preventive measures against infections. Periprosthetic joint infection can become clinically apparent during the first year postoperatively. Early-onset PJI occurs less than 3 months postoperatively, whereas delayed-onset and late-onset PJI manifest between 3 and 12 months and 12 and 24 months postoperatively, respectively.10 Because there was significant variability in the definition of PJI, the Musculoskeletal Infection Society established specific criteria to aid clinicians in its diagnosis. One major criterion or 4 minor criteria should be met for the diagnosis of PJI to be made (Table 1). This article reports current therapeutic applications against PJI and osteomyelitis with a focus on novel antibiotics. The general principles of pathophysiology and the conventional therapeutic approach to these infections are discussed to improve understanding of the clinical benefits of these newer antimicrobial therapies. The combination of a surgical procedure with systemic antibiotic administration is the gold standard approach to treating PJI. Various surgical strategies have been proposed, including tissue debridement with implant retention or removal of the prosthesis with 1- or 2-stage reimplantation, permanent prosthesis removal, amputation, and arthrodesis. Antibiotics alone have also been used to treat PJI. Acute osteomyelitis is usually treated with systemic antibiotics alone, whereas chronic osteomyelitis often requires the combination of surgery and antibiotics owing to the need to remove the necrotic tissue and/or reconstruct the bone to restore function.17 The choice of the appropriate antibiotic regimen should be guided by evidence-based protocols and the results of tissue culture. As a result of increasing antibiotic resistance, novel antibiotic therapies and innovative methods of administration have been developed to enhance the clinical effectiveness of antibiotics, reduce the incidence of side effects, and improve patient outcomes.18 Antibiotics that can be used for empiric or directed treatment of an implant-related infection are listed in Table 3. Ceftaroline and ceftobiprole are novel antibiotics that are effective against a broad spectrum of gram-positive organisms, including MRSA. These 2 antimicrobials can also be used as alternatives to vancomycin. In vitro experiments investigating the potential of ceftaroline to treat staphylococcal PJI (including MRSA and methicillin-resistant Staphylococcus epidermidis) have had promising outcomes.37–39 Malandain et al40 reported the outcomes of 16 patients who were treated for complex PJI using ceftaroline. Most patients had previous surgeries and a history of PJI. In 86% of the cases, ceftaroline was used in combination with another antimicrobial, mostly rifampin. The success rate was 44% at 6-month follow-up. Two patients experienced neutropenia after 2 weeks and after 8 weeks of treatment, respectively. The authors suggested closed hematologic monitoring in patients who receive ceftaroline for more than 2 weeks.40 One case of osteomyelitis involving the second and third metatarsophalangeal joints for which ceftobiprole was used as therapy was reported. This patient received intravenous ceftobiprole for 6 weeks in combination with local surgery to address concomitant septic arthritis and osteomyelitis caused by a polymicrobial infection that included MRSA and had a successful result.41 No impairment of complete blood count or renal function was observed in this patient. Limited data exist regarding the outcomes of bone infections treated with a combination of newer antibiotics. Kurtzhalts et al42 reported the case of a 64-year-old man who was successfully treated for pubic symphysis osteomyelitis using ceftolozane and tazobactam. This novel antibiotic regimen was combined with surgical debridement to eradicate multidrug-resistant Pseudomonas, which was the identified cause of osteomyelitis following bladder fistula formation after radiation in this patient.42 A combination of linezolid plus rifampicin as an adjunct to surgery resulted in successful treatment of recurrent MRSA osteomyelitis in a 79-year-old woman.43 The combination of antibiotics, careful drug monitoring, and surgical treatment was helpful in avoiding the thrombocytopenic effect of linezolid and preserving its bacteriostatic properties against the MRSA. Dupieux et al44 reported that oxacillin can enhance the otherwise weak intracellular activity of daptomycin in an acidic environment. Oxacillin significantly improves the effectiveness of daptomycin against the osteoblastic reservoir of Staphylococcus aureus. An in vitro study showed that ceftazidime in combination with avibactam could potentially be useful against KPC-producing Klebsiella pneumoniae clinical isolates.45 Rico-Nieto et al46 reported the case of a patient who had a multidrug-resistant Klebsiella pneumoniae infection on lumbar arthrodesis implants. This patient was successfully treated with ceftazidime plus avibactam without removal of the implants. When different antibiotics were compared with combination therapies against PJI in a mouse model, the combination of rifampin with ceftaroline or linezolid was superior to daptomycin, ceftaroline, or doxycycline monotherapy.47Table 4 provides a summary of recent studies reporting the dose and type of combined antibiotic therapy used to successfully treat orthopedic infections. 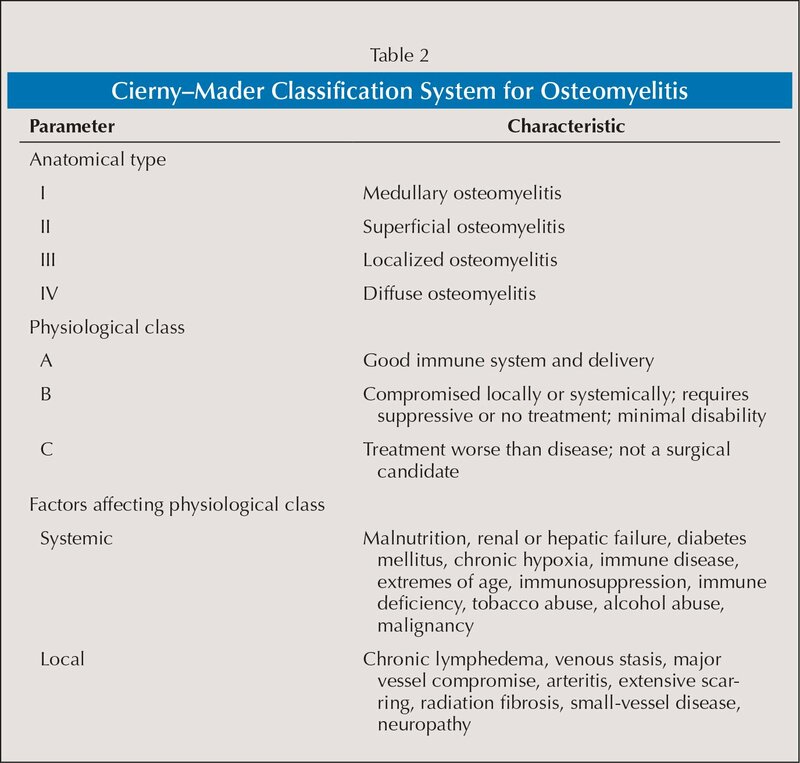 Periprosthetic joint infection and osteomyelitis are mostly caused by staphylococcal species and are often difficult to treat. As a result of increased antibiotic resistance and failure rates with the use of traditional antibiotics, new antimicrobials are urgently needed. Tedizolid, radezolid, dalbavancin, oritavancin, and ceftobiprole represent this new generation of antimicrobials that are now being implemented in clinical practice and have shown promising clinical outcomes. The combination of novel antibiotics with conventional therapies, including surgery, might be useful for preventing the side effects of these new medications until more safety data become available. Pfuntner A, Wier LM, Stocks C. Most frequent conditions in U.S. hospitals, 2011. https://www.hcup-us.ahrq.gov/reports/stat-briefs/sb162.pdf. Accessed May 10, 2018. Durkin MJ, Corey GR. New developments in the management of severe skin and deep skin structure infections: focus on tedizolid. Ther Clin Risk Manag. 2015;11:857–862. Park KH, Greenwood-Quaintance KE, Schuetz AN, Mandrekar JN, Patel R. Activity of tedizolid in methicillin-resistant Staphylococcus epidermidis experimental foreign body-associated osteomyelitis. Antimicrob Agents Chemother. 2017;61(2). doi:10.1128/AAC.01644-16 [CrossRef]. Melinta Therapeutics, Inc. Safety and efficacy study of oxazolidinone to treat pneumonia. https://clinicaltrials.gov/ct2/show/NCT00640926. Accessed May 20, 2018. 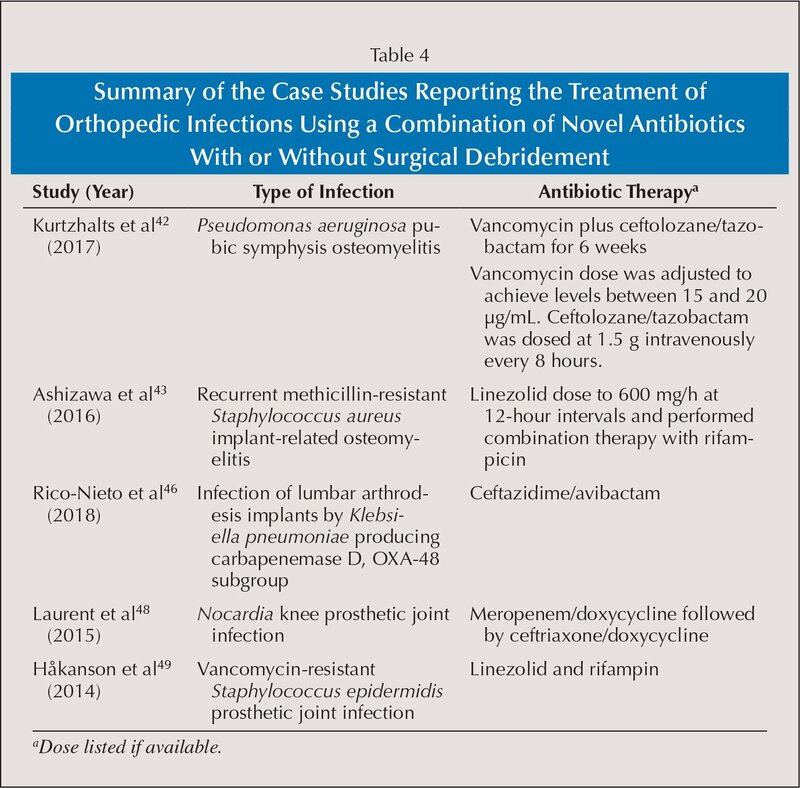 Rico-Nieto A, Moreno-Ramos F, Fernández-Baillo N. Lumbar arthrodesis infection by multi-resistant Klebsiella pneumoniae, successfully treated with implant retention and ceftazidime/avibactam. Rev Esp Cir Ortop Traumatol. doi:10.1016/j.recot.2018.02.002 [CrossRef]. Håkanson A, Fröding I, Ottosson C. Vancomycin resistant Staphylococcus epidermidis caused prosthesis infection: linezolid and rifampicin healed the complicated infection [in Swedish]. Lakartidningen. 2014;111(9–10):396–398. Kurtzhalts et al42 (2017) Pseudomonas aeruginosa pubic symphysis osteomyelitis Vancomycin plus ceftolozane/tazobactam for 6 weeks Vancomycin dose was adjusted to achieve levels between 15 and 20 µg/mL. Ceftolozane/tazobactam was dosed at 1.5 g intravenously every 8 hours. The authors are from the First Department of Orthopedic Surgery (IKB, GDC, TS, ODS, PJP) and the Fourth Department of Internal Medicine (ST), National and Kapodistrian University of Athens, Medical School, Attikon University Hospital, Athens, and the Laboratory of Molecular Pharmacology (AK), School of Health Sciences, University of Patras, Patras, Greece. Dr Papagelopoulos is a previous Blue Ribbon Article Award recipient (Orthopedics, May/June 2018). Drs Bolia and Tsiodras contributed equally to this work and should be considered as equal first authors. Correspondence should be addressed to: Panayiotis J. Papagelopoulos, MD, DSc, FACS, First Department of Orthopedic Surgery, National and Kapodistrian University of Athens, Medical School, Attikon University Hospital, Rimini 1, Chaidari, 12462, Athens, Greece ( pjporthopedic@gmail.com).